Tuesday January 29th 1884 I finished up the sheets today and got them out to bleach. Rob does not seem so well and Dr Moon was here again tonight. Julia was in town all the afternoon having work done on her teeth. I had a letter from Vene. We got part of the ironing done. 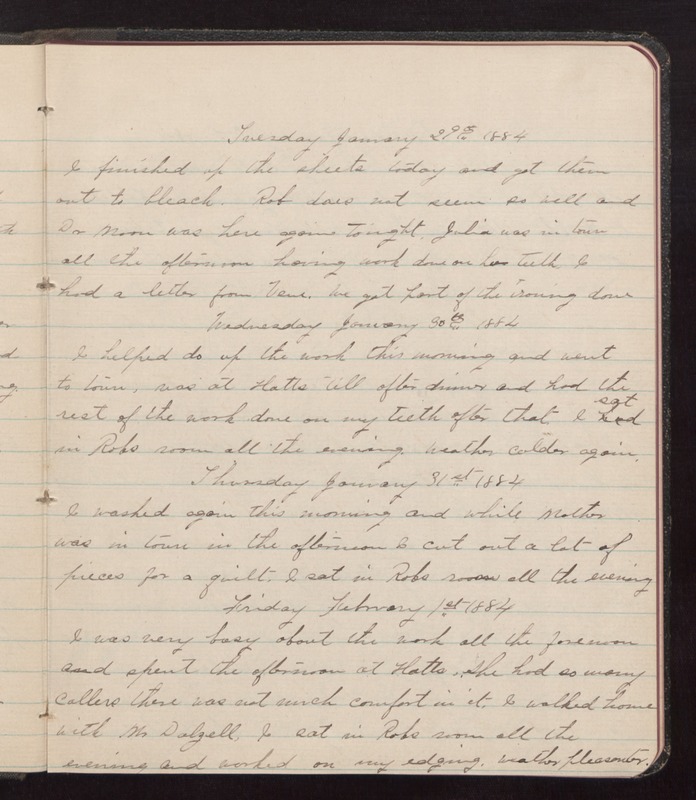 Wednesday January 30th 1884 I helped do up the work this morning and went to town, was at Hatts well after dinner and had the rest of the work done on my teeth after that. I sat in Robs room all the evening. Weather colder again. Thursday January 31st 1884 I washed again this morning and while mother was in town in the after I cut out a lot of pieces for a quilt. I sat in Robs room all the evening. Friday February 1st 1884 I was very busy about the work all the forenoon and spent the afternoon at Hatts. She had so many callers there was not much comfort in it. I walked home with Mr Dalzell. I sat in Robs room all the evening and worked on my edging. Weather pleasanter.